Pimento cheese sirloin sliders are a delicious and easy New Year’s Eve appetizer. Also the perfect snacks during the New Year’s Day football games! New Year’s Eve appetizers seem to be on everyone’s mind when I asked on Twitter what today’s post should feature. 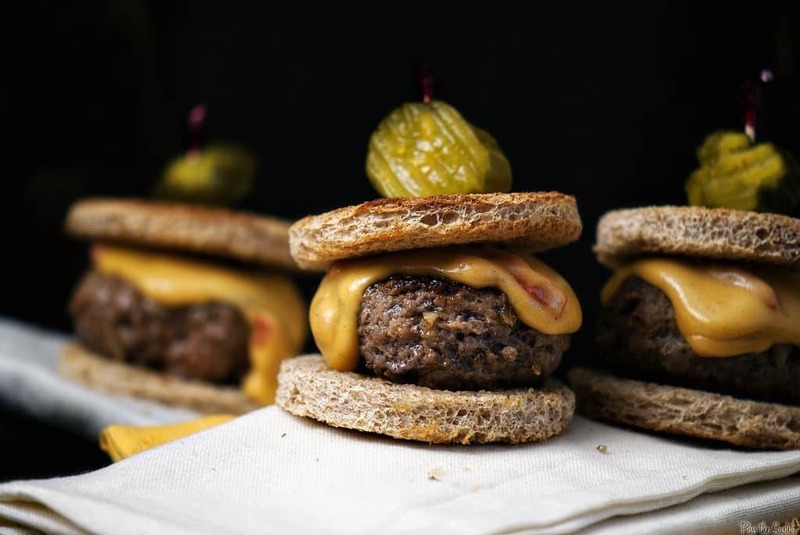 These pimento cheese sirloin sliders are uber tasty little treats if you are having yourself a shindig this Saturday night. Heat the oven to 350 degrees F. With a biscuit cutter, cut the bread into 3 inch rounds or trim into slider sized squares. Arrange on a baking sheet and bake until lightly toasted and golden, 8 to 10 minutes. Combine the meat with the garlic, onion, paprika, beer, salt and pepper. Mix and form 8 burger (about 3 inches each) and drizzle with olive oil. Heat a griddle pan or large cast-iron skillet over medium-high heat. Cook the patties for 3 to 4 minutes on each side. Meanwhile, in a saucepan, melt the butter over medium heat. Whisk in the flour and milk and simmer to thicken for about 3 minutes; season with salt and pepper. Melt in the cheese and stir in the pimentos, mustard and hot sauce. 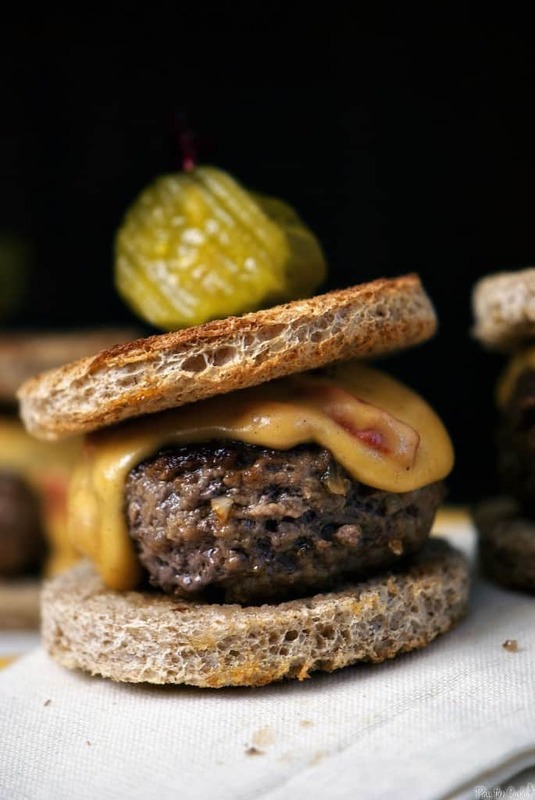 Divide the patties among 8 toast slices and top with the cheese sauce and another slice f toast. Garnish with the pickles and secure with toothpicks. Congrats to Jenny @ Savour the Senses! She won my holiday swag giveaway! What are you doing this New Year’s Eve? I am now hooked on pimento cheese! I had a pimento burger in Charlotte and I loved it. These sliders look so good! 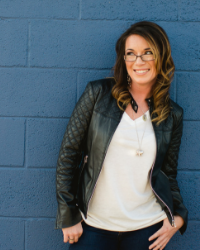 PS- I agree with you about RR mag pages… need the date! These are AWESOME! Look so mysterious and festive and perfect for ringing in the new year. These are SO cute. I love sliders. 🙂 And I’m so happy you used dill pickles. Half sours ruin burgers. Can I just tell you how much I am drooling over this recipe!! Totally want to make these!! These are the cutest little sliders. So unique too. Sounds delicious! Gorgeous little sliders. They look irresistible! With plans to travel to Canada the first week in January, we might just sit at home, ignore the parties, and drink lots of champagne. Enjoy! Oh, yeah…these will be a crowd pleaser!!! Fabulous sliders, Kita! I love appetizers. 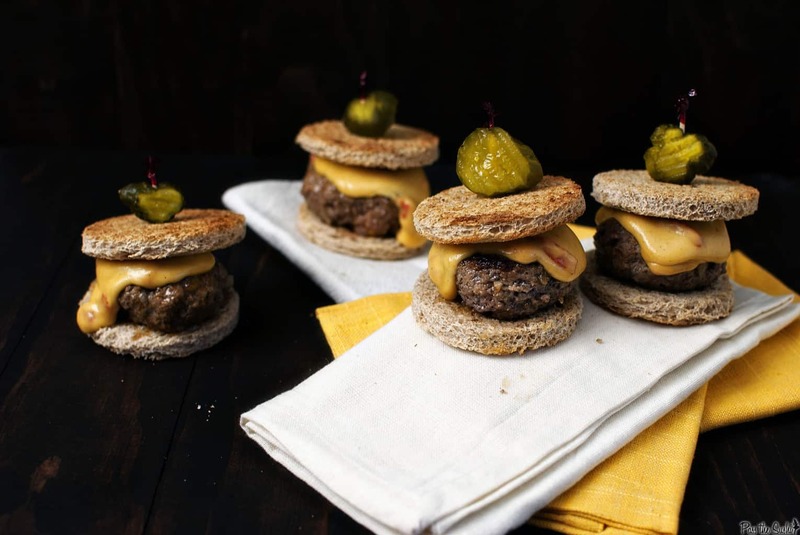 These little burgers are perfect for new years eve. Happy new year! Your pictures are gorgeous as always. Totally making me drool over here! 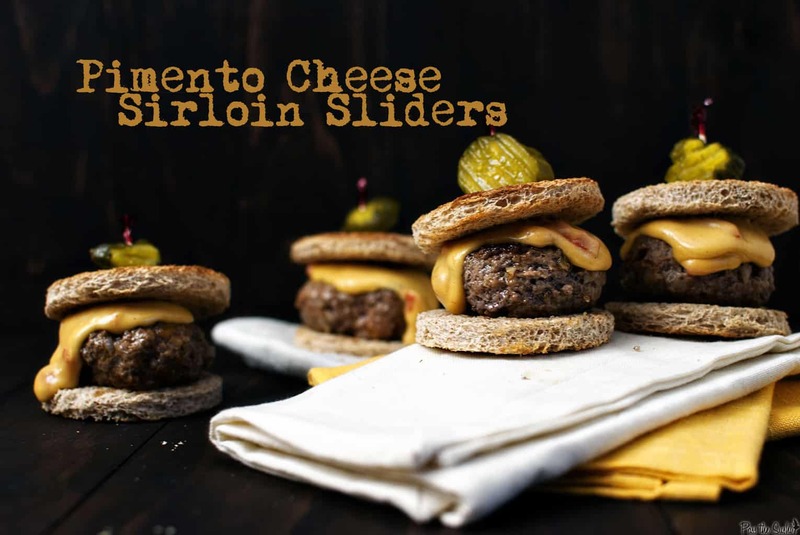 These sliders look amazing and sounds sooo delicious. This will be on my must cook list!